The Program for Hellenic Studies under the umbrella of the European Studies Council at The MacMillan Center supports and coordinates the study of post-Antiquity Hellenic culture and civilization. Established in July 2001 with the generous support of the Stavros Niarchos Foundation, and from 2007 onwards funded by the Stavros Niarchos Center for Hellenic Studies at Yale, the Program organizes lectures, symposia, conferences and supports faculty and student scholarly activities, as well as cultural events. The Program of Hellenic Studies offers a comprehensive program of instruction in the modern Greek language at the elementary, intermediate and advanced levels and cooperates closely with the Center for Language Study at Yale University for the development of technology-based teaching aids for the acquisition and mastering of modern Greek and the enrichment of other Hellenic oriented courses. In addition, the Program offers a variety of courses in modern Greek literature and culture as well as in Ottoman and modern Greek history providing students with the opportunity to study post-classical Greece in a broad geographical, historical, and comparative context. The Program also fosters courses in other departments, including Byzantine history and Byzantine history of art. New Center at Yale To Support Study of Greek Heritage and Culture. Stavros S. Niarchos understood the meaning of thinking and acting globally long before the term globalization became so prominently used in public policy and economics. His business operations began in Greece, the country of his birth and heritage, yet his accomplishments were notable worldwide. He was considered to be one of the most successful businessmen of the twentieth century. 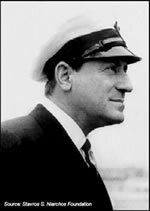 Although known predominantly for his shipping business, Niarchos’s diversified financial activities were at the core of global industry from the time he formed the Niarchos Group in 1939 until his death in April 1996. His legacy continues into the twenty-first century with the establishment, upon his death, of the Stavros S. Niarchos Foundation. Committed to working in Greece and internationally, the Foundation derives its mission from Niarchos’s keen instincts and interests in providing access to opportunity in the fields of education, social welfare, health, and arts and culture. Stavros S. Niarchos was born July 3, 1909 in Athens. He studied law at the University of Athens and began working in 1929 in his family’s grain business. He soon convinced his family that it could save money by owning the ships that provided the transportation. The first six freighters were bought during the Great Depression. While Niarchos served in the Greek Navy during World War II, the Allied Forces leased his first vessel. Niarchos participated in the Allied operations in Normandy and was awarded the Order of the Phoenix, the Royal Order of King George I, and the Royal House Order of SS George and Constantine, among other distinguished service medals. After the destruction of his vessel, he used the insurance funds to buy six oil tankers. Thus began the emergence of Stavros Niarchos as a significant participant in the world of international commerce. In 1956, less than twenty years after creating his own firm, Niarchos agreed to build and operate the Hellenic Shipyards, the first such private investment in Greece. Known as the Skaramanga Yard, it employed over 6,000 skilled workers and rapidly became the largest Mediterranean shipyard for repairs and new construction. Niarchos’s business philosophy in shipping was to buy and build big; his supertankers set world records for size and carrying capacity. For many years he owned the largest private fleet in the world. At its peak, his shipping company operated more than 80 tankers. Stavros Niarchos recognized the importance of having a global strategy early in his career. His vision enhanced his business and investment successes and contributed to the quality of his many exceptional collections. The family members and business associates charged with executing his philanthropic goals use the lessons and capital from his achievements to direct the Foundation’s activities in Greece and throughout the world. By designating a significant part of his estate to establish the Stavros Niarchos Foundation, Niarchos created an enduring commitment to enriching the lives of others around the world. The Stavros Niarchos Foundation Lecture in Hellenic Studies was established in 2004 in honor of the Program’s sponsors. The Program had been funded by the Stavros Niarchos Foundation as a pilot program from 2001 to 2007. In 2007 the Board of Directors of the Foundation endowed the Stavros Niarchos Foundation Center for Hellenic Studies at Yale University, which funds activities of the Hellenic Studies Program at the Whitney and Betty MacMillan Center for International and Area Studies, Yale University. The lecture series brings to the Yale campus distinguished scholars in the humanities and social sciences, public figures, and artists of international reputation.